Newmans Air inaugurated a service using a De Havilland of Canada D.H.C. Dash 7 ZK-NEW. The flight was scheduled to commence on the 11th but was postponed until the next day. Souvenir covers were printed for the company and a special postmark was used at Rotorua. The covers were backstamped at Christchurch on the same day. Overseas Flight: 1985, 19 Mar. Commenced by Air Albatross Metroliner. Souvenir covers cancelled CHRISTCHURCH 1 AP 85-1 were flown to Nelson and backstamped NELSON 1AP8511.3OAM and then flown by favour on the first return Nelson-Christchurch flight. Overseas Flights: 1985, 29 Aug. / 1985, 10 Sept. / 1985, 30 Sept. / 1985, 29 Oct. / 1985, 29 Oct.
On 17 December 1935. Special covers were printed by Ferrymead Historic Park and were postmarked at the Historic Park Post Office. They were then flown in Douglas DC-3 ZK-BBJ and were signed by the pilot Bruce B. Thompson. Of the inauguration of the Cook Strait Airways Nelson-Wellington and return service. A special cover showing D.H. Dragon Rapide ZK-AEE was postmarked at Nelson and backstamped at Wellington on 30 December. Special flight by Hughes 500 helicopter of Garden City Helicopters Ltd carrying a souvenir mail in each direction. Special vignettes were also produced and one was affixed to each cover. Souvenir covers with Rail/Air "Flying Locomotive" emblem postmarked BLENHEIM 10 FEB 87 and bore on the reverse an N.Z. Railways "Speedlink" label tied by a cachet reading PARCEL Ex. ll FEB 1987 CHRISTCHURCH. Covers were posted at Blenheim and were flown to Wellington and Christchurch on the NZR Douglas DC-3 "Speedlink" route. Overseas Flights: 1987, 26 Feb. / 1987, 23-28 Mar. Golden Jubilee 1937-1987. The former Harewood Airport was established and administered by a committee of the Christchurch City Council until 1986 when responsibility was transferred to the Christchurch International Airport Company Ltd. It is the only international airport in the South Island of N.Z. and is the base for the US. Operation Deep Freeze. A large pictorial datestamp was in use at the Chief Post Office, Christchurch to commemorate the Jubilee. Inaugurated by Ansett (N.Z.) with Boeing 737. 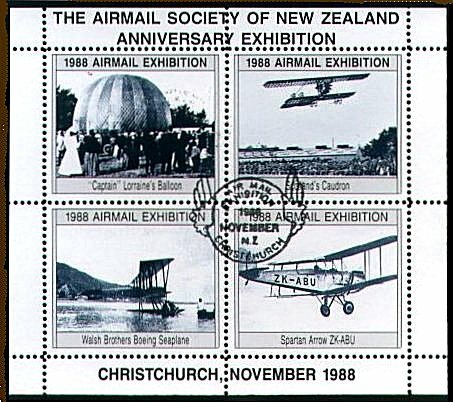 A small unofficial mail consisting mainly of 103 privately printed souvenir covers was postmarked CHRISTCHURCH 24 JY 87.1 and was flown to Auckland where it was backstamped on 27 July. A batch of 102 similar covers was postmarked AUCKLAND 24 JY 87.1 and was flown to Christchurch and was backstamped on 27 July. The flight from Christchurch-Auckland was made by ZK-NEA and the return by ZK-NEC. Mount Cook Airlines took over the route from Air New Zealand and began a service using HS.748 ZK-MCA. A small mail of 125 souvenir covers postmarked CHRISTCHURCH LOOSE LETTER - 21 SP 877 AM was flown to Nelson and backstamped the same day. Overseas Flights: 1987, 28 Oct. / 1987, 30-31 Oct.-2 Nov. / 1987, 30 Oct. The Pacifica Air tourist feeder service was inaugurated by Metroliner ZK-MES carrying a small unofficial mail of 105 special covers postmarked CHRISTCHURCH LOOSE LETTER 6 JA 88. The covers were backstamped at Wanaka on the same date. By the British-built Colt AS-56 airship G-BLSI "Miami Cooler" piloted by Wing Commander Gerry Turnbull. 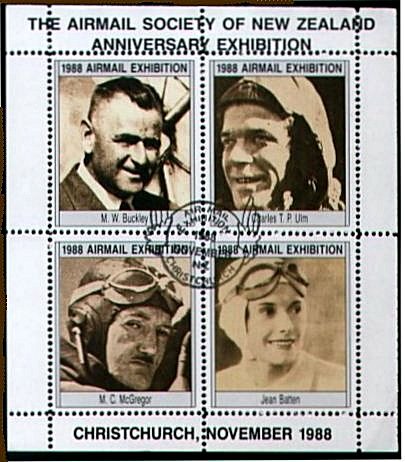 The Timaru Philatelic Society produced special covers and organised the mail flights. No flights were made on the 7th because of turbulence but covers were flown on the 8th and 9th, when one free flight and two tethered flights were made on each day. Covers, signed by the pilot, were postmarked at the Chief Post Office, Timaru, and a relief datestamp reading BALLOON. FLT NZ (without a date) was also applied. Overseas Flights: 1988, 31 Mar. / 1988, 10 Sept. Arranged by the Organising Committee of the 20th International Ornithological Congress and the 'Birdpex 90' Philatelic Exhibition. (See 6 Dec. 1990.) Pigeons were released at the Philatelic Foundation building and on return the flimsies were "franked" with special cinderella "stamps". Overseas Flights: 1988, 13 Oct. / 1988, 6 Nov. Souvenir covers were illustrated on a large special postmark used on the opening day of the exhibition. Four different cinderella sheetlets were also produced. Organised by the committee of "Birdpex 90" Exhibition and flown during the 20th International Ornithological Congress which was being held at Christchurch. Pigeons were released at Mount Hutt Station (a large Canterbury pastoral holding) approximately 104km from Christchurch, and when the 1,000 special flimsies arrived in Christchurch a "Birdpex" Cinderella "stamp" was affixed to each one which was then enclosed in a souvenir envelope. With Metroliners ZK-POA and ZK-POB. This was a joint venture by N.Z. Post and Airwork (NZ) Ltd to distribute air mail to the main Mail Centers at Christchurch, Manawatu, Auckland and Wellington on five nights each week. With the exception of a very small number of covers with a private cachet, no identifying markings were applied to mail on these flights. Christchurch-Manawatu (Palmerston North). Westons Winery Promotion flight to the Dunedin Festival Air Show at Momona Airport a replica S.E.5a first world war fighter registered ZK-TOM was built by Tom Grant, who flew it from Waikari to Taieri aerodrome and then to the air show at Momona. He carried 500 souvenir covers "franked" with a Westons Winery Cinderella "stamp" which was tied with a rubber-stamp cachet. The Airpost Division of NZ Post commenced a mail service by Friendship. A few covers postmarked at Christchurch on 31 March and bearing an unofficial cachet were flown to Wellington where they were backstamped on the same date. Overseas Flight: 1992, 26 June-1993, 21 Aug. Between Hokitika and Okuru A.H. Nancekivell and J.B. Renton in Simmonds Spartan ZK-ABU. A pair of cinderella miniature sheets was produced by Stirling & Company, Christchurch showing an unaccepted essay of a 1932 airmail stamp. Anniversary flight covers bearing a red cinderella sheet were flown from Hokitika to Haast on 28 September and were backstamped on the 29th. Covers bearing a blue cinderella were flown from Franz Josef Glacier to Hokitika on 29 September and backstamped the same day. During a period of heavy rainfall in the Milford area severe slips blocked road access and helicopters were used to fly out tourists. Some mail was flown in but identification of the aircraft or mail is difficult. One letter seen was posted Christchurch on 8 October addressed to T.H.C. Hotel, Milford Sound and backstamped Te Anau 18 Oct. and endorsed with the RETURN TO SENDER cachet. Overseas Flight: 1993, 4 Nov.
Takaka Valley Air Services commenced a weekly service on Friday, 19 November with Piper Aztec E ZK-FHO (Stuart Rae). A small unofficial air mail was carried in each direction. Covers have a rubber-stamped cachet. Heavy flooding in and around Kaikoura resulted in the cutting of road and rail links and the suspension of mail services. On the 24 December Piper Aztec ZK-DHB of Southflite flew from Christchurch to Kaikoura and arrived at 11.45am carrying 300kg. of mail which had accumulated over the four days. No airmail fee was charged on these items and no distinctive markings were applied. No outward mail was flown. Overseas Flight: 1994, 17 Feb. / 1994, 10 & 16 Sept. / 1994, 6 Oct.
To commemorate the 100th anniversary of the sinking of the S.S. Wairarapa, the pigeongram company issued new private stamps depicting the ship. These were printed in a maroon color in sheets of 6 triangular shaped stamps in two values; 3 0f $15 and 3 of 1s6d. The flimsies have the $15 stamps on them and the covers that they were inserted in after the flight are franked with the 1s6d stamp. The pigeon flight from Miners Head to Auckland departed at 11am. NZ Post used a special pictorial postmark at Dargaville. 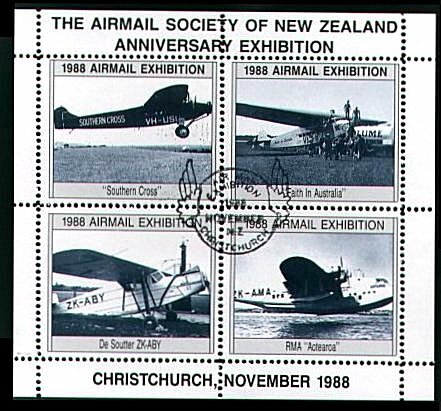 The Northern Wairoa Aero Club of Dargaville prepared 825 covers which were datestamped with an Auckland cds 16DE94 (not tied) and then flown from Mechanic's Bay, Auckland to Dargaville on board a Grumman Widgeon, where they received the special pictorial postmark on an 80c stamp. The aero club also produced a cinderella label depicting George Bolt in sheets of 4 but these were not applied to the covers and were sold separately. 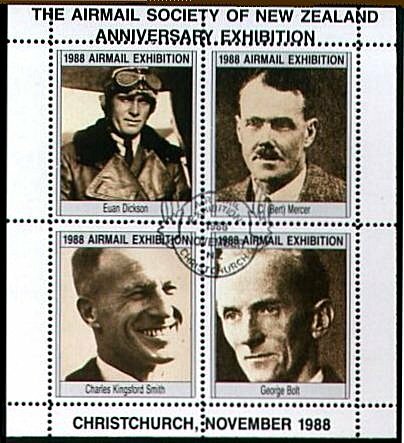 Other unflown items items available include NZ Post's special datestamp service prepaid postcards, a privately produced blue commemorative card and collector prepared covers. Pilot Bert Mercer. Lindsay Armstrong of Wellington produced two different sheets of cinderella labels for this anniversary, one on yellow paper, and one on red paper. Four different designs were used for the labels, one with a fox moth, one with Bert Mercer, and two with text only. These labels were used on covers flown at the celebrations at Hokitika. A Percival Proctor was flown by Mervyn Falconer. In addition, covers were couriered by Richard Waugh on board a Warbirds Dakota from Lake Station, Nelson to Hokitika on 16 December. These were datestamped at Nelson 15 Dec 1994. Overseas Flight: 1994, 17 Dec. / 1995, 29 Jan.